Make a donation to our year end campaign. Secure online giving coming soon. Appreciated stocks and securities can be donated to the Charlotte Master Chorale. Leave a Legacy through your planned gift to the Charlotte Master Chorale. You may be looking for a way to make a big difference to help further our mission. If you are 70½ or older, you may also be interested in a way to lower the income and taxes from your IRA withdrawals. An IRA charitable rollover is a way you can help continue our work and benefit this year. Gifts to the Charlotte Master Chorale have an immediate impact. Like many other arts organizations, we cannot rely on ticket sales alone. Your generous contribution, no matter how large or small, allows us to fulfill our mission and continue bringing high quality choral performances to the Charlotte region and beyond. Make your gift today! 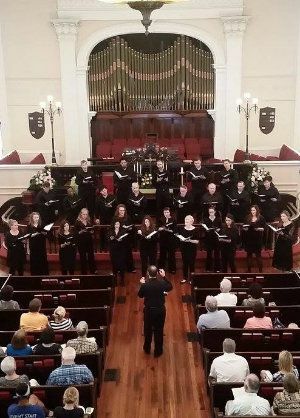 The Charlotte Master Chorale holds a unique place in the hearts and minds of the region's choral music lovers. Founded in 1951 as the Oratorio Singers of Charlotte, we have been living out the original vision of the founding members to perform great choral masterpieces, especially large-scale choral-orchestral works. But we do more than just that. We also perform smaller scale, and more modern works. 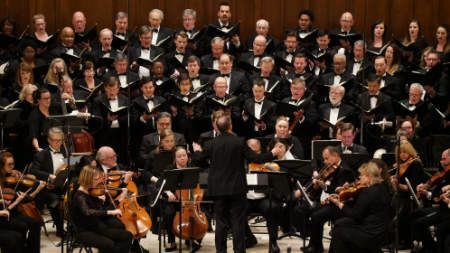 And while we are probably best known for our performances with the Charlotte Symphony, we also perform our own concerts—both with the full chorus and with the more intimate Charlotte Master Chorale Chamber Singers(pictured, right). Our mission is to enrich our community through choral music. This season features such traditional favorites as the BrahmsRequiem and Handel's beloved Messiah, as well as a performance with the Charlotte Children’s Choir that features Kile Smith’s Consolation of Apollo, a work celebrating the fiftieth anniversary of the first manned space flight to orbit the moon and return to Earth. These affordable concerts provide accessibility to outstanding classical music events. We appreciate the support our community has given to us through the years, and we thank you for your continued support. Charlotte Master Chorale, Inc. is a 501(c)(3) nonprofit organization. Our Form 1023 application is pending approval with the Internal Revenue Service. We have no reason to believe that contributions will not be tax-exempt for the 2018 tax year to the extent allowed by law.